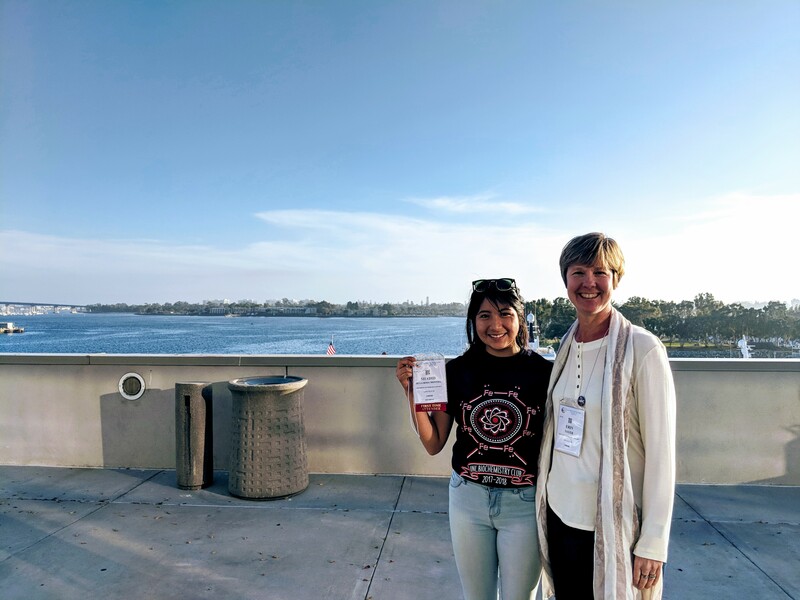 Erin Sayer (right) with Shadid de La Rosa Montiel, a senior biochemistry major, at the ASBMB annual meeting in San Diego in the spring of 2018. Lincoln, Neb. — Erin Sayer, assistant professor of practice in the Department of Biochemistry, has been elected to serve a three-year term as co-director of the Northwest Region of the Student Chapter Steering Committee for the American Society for Biochemistry and Molecular Biology (ASBMB). As co-director, she will work with her colleague from St. Mary’s University of Minnesota, and 12 other regional directors to support the efforts of ASBMB student chapters in her region and across the country. Student chapters provide opportunities for students passionate about life science, particularly in biochemistry and molecular biology, to do research, outreach, and career development. Sayer is faculty sponsor of the UNL Biochemistry Club, which was selected in 2017 as the ASBMB Outstanding Student Chapter. She has sponsored several undergraduates through student chapter travel grants so they can attend the annual meeting of ASBMB and present their research.